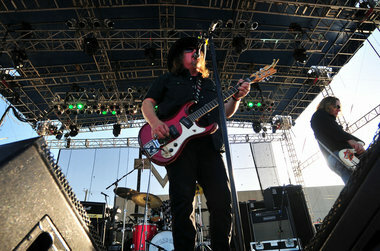 The second set of the evening emphasized rowdy Southern rock, and fans responded with gusto. BIRMINGHAM, Alabama -- Frisbees flew. Beers were raised. Hands shot up in the heavy-metal "I love you" salute. The audience at the main stage got thicker tonight during Drivin N Cryin's 6 p.m. set at the Schaeffer Eye Center Crawfish Boil. That's really no surprise; Kevn Kinney and his bandmates are no strangers to Birmingham, and the Southern rock group is a favorite at some of our local nightclubs. Drivin N Cryin -- a little bit Skynyrd, a little bit Pixies -- blended good ol' boy country flavor with spiky punk influences during the hourlong performance. Classic-rock fans surely had a flashback or two when the band swung into Deep Purple's "Smoke on the Water" and the Beatles' "Why Don't We Do It in the Road?" But Drivin N Cryin also had a hit or two of its own to perform. The lusty rendition of "Fly Me Courageous" was a definite crowd-pleaser, and the same goes for a rowdy take on "The Innocent." Kinney's nasal voice didn't always cut through the sound mix, and at times, it was difficult to make out the lyrics he sang. No matter, though. By the second set of the evening, the crowd was getting into full-on festival mode, reveling in the good-time atmosphere and powerful guitar solos.